November 13, 1942, for most an inconsequential date: unlike December 7, 1941, Pearl Harbor’s bombing, or September 11, 2001, the terrorist attack on the United States, November 13, 1942, is not “a date, which will live in infamy”. On this day the U.S.S. Juneau sank after being hit by a Japanese torpedo near the South Pacific’s Solomon Islands. Although this date is not recorded in most history books, it resulted in great human tragedy and Armed Forces protocol reform, which has forever changed the military. The Sullivan family of Waterloo, Iowa, led lives like many other families of the early 1900s. 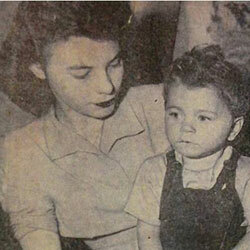 Thomas Sullivan, a first generation American, was a train conductor while his wife, Alleta, was a homemaker. As a large Irish-Catholic family they had six children: George born December 14, 1914, Francis born February 18, 1916, Genevive born February 19, 1917, Joseph born August 28, 1918, Madison born November 8, 1919, and Albert born July 8, 1922. 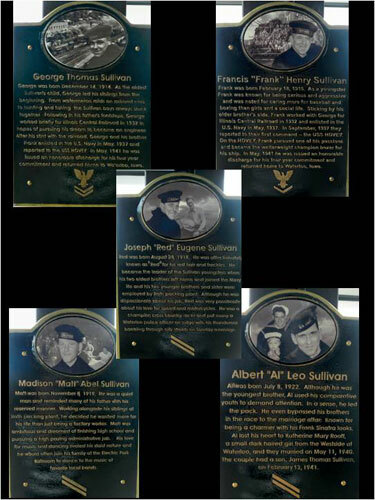 Growing up, the five boys were inseparable, referred to as “The Fighting Sullivans,” and according to family spokesperson, Kelly Sullivan-Loughren, a name that suited these spirited boys. 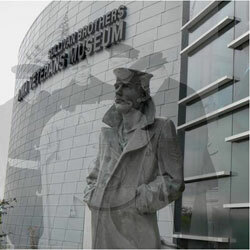 When news of Pearl Harbor was announced via radio the brothers, like many of their countrymen, felt a sense of nationalism and rushed to defend their country. 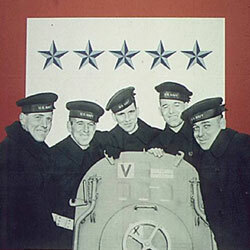 George and Francis had previously completed four years in the Navy and in remembrance of their friend Bill Ball, who died on the U.S.S. 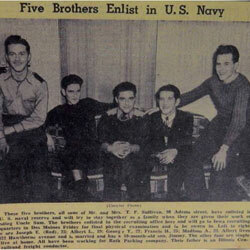 Arizona, all five brothers enlisted January 3, 1942, following their family’s motto, “We Stick Together.” While the Navy discouraged the practice of brothers serving in the same command, the Sullivans insisted. 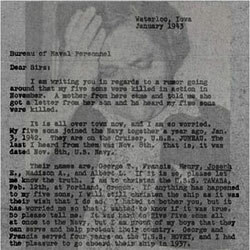 George had written in a letter to the Navy Department, “We’ve always fought for each other, and now we want to continue fighting side by side.” The Navy complied. 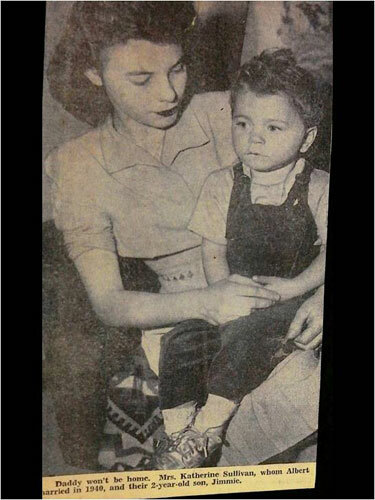 In the Fall of 1942, Alleta’s sense of mother’s intuition, the lack of letters from the boys, and rumors heard from a neighbor who had received a letter from her son stating, “Isn’t it too bad about the Sullivan boys? 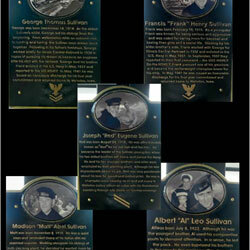 I heard their ship was sunk,” left the Sullivan family anxious. 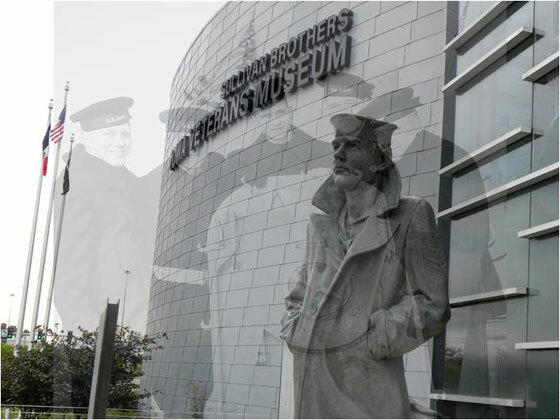 When three men in naval uniforms exited the black sedan January 11, 1943, at the Sullivan home on 98 Adams Street in Waterloo, Iowa, "Which one?" was all Thomas Sullivan could utter. “I’m sorry. All five,” Lieutenant Commander Truman Jones replied. 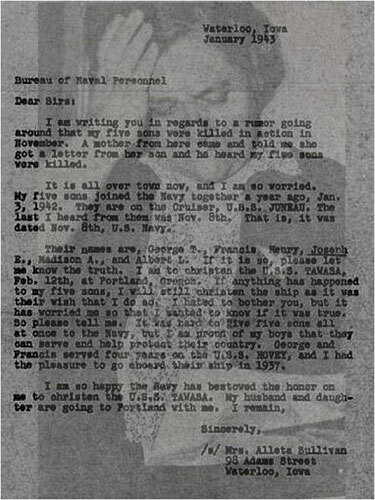 “The Navy Department deeply regrets to inform you that your sons: Albert, Francis, George, Joseph and Madison Sullivan are all missing in action in the South Pacific." 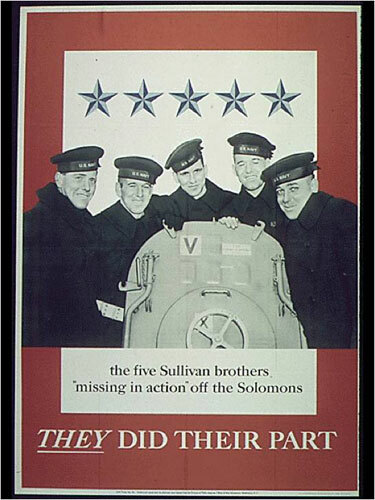 In George Sullivan’s letter urging the Navy to bend their rules and allow the brothers to serve together, he had written, “If we go down, we’ll all go together,” and tragically they had. 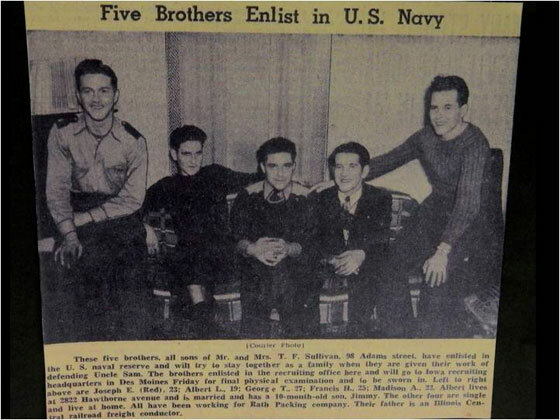 Magnitude of the loss of the five Sullivan brothers from Waterloo, Iowa, captured the country's sympathy. Following her own advice to “Keep your chin up,” parents, Alleta and Thomas, began a War Bond Tour speaking at war factories, promoting the war effort and requesting support so their sons’ deaths had not been in vain.